The confluence of depressed conditions pre-existing from World War I; Japan’s takeover of Manchuria from China and their victory over czarist Russia much earlier; Italy’s invasion of Abyssinia; the remnants of the Spanish Civil War from 1936-1939; and Adolf Hitler’s miraculous rise and re-militarism of Germany’s Rhineland in 1936. All of these events led into WWII and fueled multi-national participation. Later, Hitler would invade and defeat Holland, Luxembourg and France, taking over Poland, as well. This began the most destructive war in history, and the most in terms of human lives lost. At first, it seemed as if German unity was forming in World War I. Jews were even admitted into the officer corps and some made it to the rank of major. As time went on, front line casualties mounted and almost a third of a million Germans died at Verdun alone. At home, things were dire. Deprivations took their toll and the German people lost enthusiasm for the war. Long lines of citizens waiting for staples such as bread, milk and sugar were the new normal. Inflated black-market prices took hold. Riots sprung up in German cities. With social stress and economic pains, the latent feelings of anti-Semitism that lurked below the surface began to simmer. Poor and culturally foreign Eastern European Jews came into Germany by the tens of thousands and wound up in ghetto conditions. Right-wing members of the Reichstag blamed the Jewish men as draft dodgers and worse, (even though 12,000 Jews died for the Fatherland and 100,000 were in the ranks of the army). The war was a catastrophe. By autumn 1918, the German army was exhausted and the people restless. Revolution, mutiny and the departure of the Kaiser, who crossed into Holland as an exile and blamed the Jews for his woes added to the angst. Two million German soldiers were dead along with hundreds of thousands of civilians. At the Treaty of Versailles, Germany lost colonies, had their merchant fleet seized, saw national borders shrink and much territory occupied. Mass demonstrations, riots, strikes and gun battles made for German anarchy and chaos. Mobs took over stores, disabled soldiers became beggars and dead horses made up meals. It was an entry tailor-made made for the orator, Adolph Hitler. Adolph Hitler prided himself on being an artist. Unfortunately for him, his gift was not acknowledged and he was denied admission to the Vienna Academy of Arts. His rejection there fostered a hatred of modern art that he considered “degenerate." Movements such as Cubism and Dadaism rubbed his aesthetic ideal. He favored landscapes, old masters and classical portraits. That is what he stole in every country takeover in WWII. He announced that the other, so-called modern art could be destroyed. The higher-ups under his command, Reichsmarshall Hermann Goering, Foreign Affairs Minister von Ribbentrop, joined in the melee and enriched their own private collections with other people’s art. Soon, confiscated art was matter of course in the Third Reich. The spoils of nation states were commonplace loot. Cultural property and great art of much significance was plundered from every territory under occupation. The ERR—Einsatzstab Reichsleiter Rosenberg—a branch of the Nazi Party rose up in 1940 with the express purpose of collecting Jewish and Freemason books and documents for destruction or removal to Germany. Later in that year, the mission changed according to directives from Herman Göring, who was looking for art and other precious objects to be divided between himself and Hitler. Much was collected in Paris. Eventually hundreds of thousands of pieces, paintings, sculptures, gold, antiquities and more were stolen or “purchased" under duress. Soon, all levels of Nazi officials and military men participated. Thirty train convoys left Paris alone with 1,200 crates of masterworks between the end of 1940 and July 1944. The priceless treasures were stashed in more than a 1,000 repositories including castles, warehouses, cellars and underground bunkers. It was estimated to be 20 percent of the art of Europe. The Sonderauftrag Linz, an organization run by art historian Hans Posse, was intent on putting masterworks together for the Führermuseum. This German National Gallery ideal was to be erected near Hitler’s hometown, the Austrian city of Linz near his birthplace Braunau, and Hitler himself would be the director. A complete plan was drawn out in a sketchbook and architect Hermann Giesler, a devoted Nazi, would be tasked with the rebuilding of Linz. This was Hitler’s dream for the new German Kultur. Pieces from banker Fritz B. E. Gutmann’s most magnificent collection were just some of the stolen art. The best were to be the centerpieces of the Linz future museum: Michelangelo’s Bruges Madonna, Van Eyck’s Adoration of the Mystic Lamb (the Ghent Altarpiece) and Jan Vermeer’s The Astronomer, which was Hitler’s most cherished stolen painting. 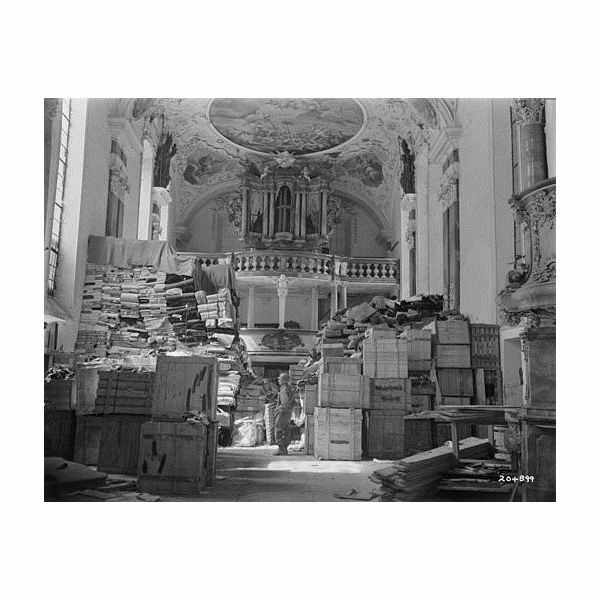 The task of a group called the Monuments Men was to protect significant cultural structures such as cathedrals and museums from wartime destruction, and to recover and return to their rightful owners the artworks the Nazis had stolen. Even today, there are at least 100,000 works of art still missing from the Nazi occupation. According to the World Jewish Restitution Organization (WJRO), “… major U.S. museums have recently been asserting defenses, such as statute of limitations, to avoid resolving on the facts and merits claims by Holocaust victims and their heirs for the restitution of art looted by the Nazis." In many cases, the art was returned to countries, not to the individuals that owned them. This put the Holocaust victims at odds with their home governments. Many of them had lost entire families in concentration camps. As Leon Meyer, Holocaust survivor has said, “This has nothing to do with money. It is about justice and a duty to remember." Goodman, Simon. Orpheus Clock: The Search for My Family’s Art Treasures Stolen by the Nazis. New York: Simon & Schuster, Inc., 2015.